Quality first is our credo. For over 20 years we have built strong relationships and earned the trust of our customers, because of our precision machining and on time deliveries. M & S Machine and Tool Corp has top-of-the-line equipment to tackle conventional and CNC milling, conventional and CNC turning, Blanchard grinding, OD Grinding, surface grinding, drilling, welding, sawing, as well as honing, deburring, and part marking. 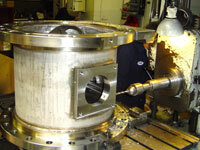 At M & S Machine and Tool Corp., we offer a variety of services, which cover the entire production process. Through our certified vendors, we can also provide heat treating, plating, rubber coating and painting. After each part is completed, our inspection department follows through with a complete and thorough inspection of every part, with our top-of-the-line inspection equipment.